Summer Newsletter: New Products, Exciting Conferences & More! - Aspire & Co Ltd.
Summer Newsletter: New Products, Exciting Conferences & More! Hello to our wonderful customers! I hope everyone is having a great summer so far. Over the past few months Aspire has had a very exciting time, with new product releases and trips to conferences as well as welcoming new pHformula specialists to our expanding family. As you may all be aware we have had wonderful new innovative product launches, all of which make perfect additions to the existing lines. As always, head office excels themselves not only in the use of cutting edge technology and ingredients but also with eye catching branding. 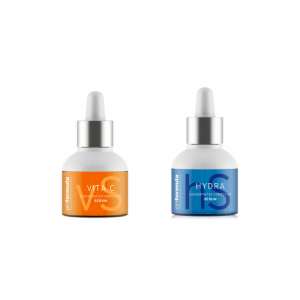 Earlier this year releases included the 3D HYDRA and VITA C concentrated serums to the new vitamin infusion line. The 3D Hydra serum contains Ferulic acid complex, Hyaluronic acid complex, C2C messenger complex, 3D delivery complex and skin identical ceramides to intensely hydrate at the skins deepest layers. This is ideal for sensitive, allergy prone skin as well as dehydrated ageing skin, increasing moisture by 30% within half an hour of application. The addition of Alpinia Galanga leaf extract helps to support the synthesis of our own natural Hyaluronic acid. The serum can be used in conjunction with the home care products but can also be used post treatments such as micro-needling, microdermabrasion, LED light therapy, Laser and IPL and post treatments followed by POST recovery cream. The VITA C serum is a concentrated serum containing 3 forms of Vitamin C as well as C2C messenger complex and hyaluronic acid complex. Jojoba extract is an excellent anti-inflammatory and as it has the same chemical property as natural sebum makes this an excellent product to introduce to your acne sufferers or those with an oily type skin. Like the other product in the Vitamin infusion line this can be used as a glide medium for needling or post LED light therapy due to the 3D hydra complex. In the same field of combating dehydrated skin, the SOS Eye Rescue Cream has already been hugely popular here. 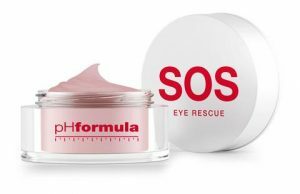 A sister product to the SOS Oil and Cream, the Eye Rescue is designed to nourish, hydrate and protect the skin around the delicate eye area. Ideal for those with ageing skin, the cream’s anti-fatigue properties make it perfect for all skin types and daily use. With high concentrations of vitamin E and light reflecting properties the cream brightens and soothes the delicate eye area. The eargerly awaited POINT range has finally arrived. It’s been a long time in the wait but believes me, it’s well worth it. 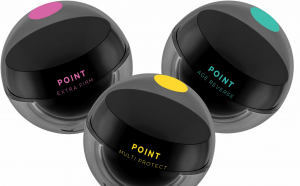 The range includes the POINT Extra Firm, a light, luxurious cream with specific peptides to tighten and firm the skin and is perfect for the older skin. Age Reverse is suited to the 30-40-year-old and contains unique peptides formulated to combat fine lines. The Multi-Protect is a peptide infused moisturiser with SPF15 with superior anti ageing properties. It also contains an anti pollution complex which protects against the harmful particulate matter in environmental pollution. Multi protect is suitable for all skin types and skin concerns. A first in the industry peptide infused skin care the range aims to combine fast and effective results effortlessly as part of a daily skincare routine. POINT is very close to Petru Van Zyl’s, (the founder) heart and she has dedicated the range in memory of her father who sadly died of Motor Neurone Disease. She is now very supportive of research into this devastating disease and internationally all distributors have agreed to support this by donating 1 Euro for every POINT sold to their local MND charity to support further research. I hope you will all support this initiative. The strap line, “The point is to make a difference” has a dual message, a huge difference to skin health and the support of research with every donation making a difference. 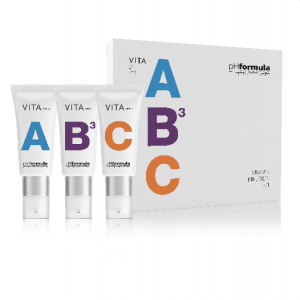 pHformula also launched the ABC Mini Kits, in time for summer trips. Travel sized versions of the well-loved VITA A, VITA B and VITA C creams make handy additions to pack with you whilst going away, or perfect mini sized versions of your favourite products to keep at home. As we know, the three vitamins are essentials for skin health and vitality. With summer well and truly with us, another recent and important topic has been the safe practice in hot weather, and the importance of hydrating and protecting the skin. Our lounge on the website we discussed what UV damage is, and debunked some of the myths surrounding sun protection and what does and doesn’t protect the skin effectively. With the growing popularity of the SOS Range and HYDRA Gel Mask, we also explained all about dehydration and the importance of hydrating skin with the same care as you would for your body. 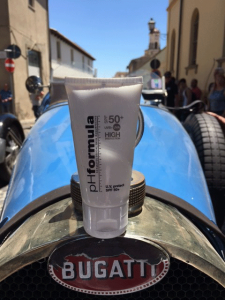 My recent trip to Sardinia travelling across the island in an open top classic car, pHformula UV PROTECT 50+ and the POWER ESSENCE Tonic proved vital in the soaring temperatures. A typical skin type II who turns rapidly into a tomato in the sun I was amazed just how effective the sunscreen is. Not only does it protect against UVA and UVB rays it also blocks Infrared rays IRA. The IRA penetrates deep into the hypodermis causing collagen destruction, decreases collagen synthesis leading to premature ageing. I even managed to get Patrice to use both, which as many of you will know, men just don’t use protection. 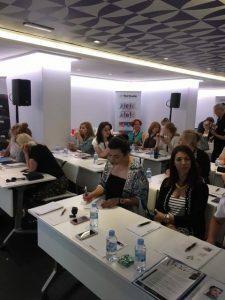 Barcelona hosted the second international distributor’s and educator’s conference in June. As always it was an excellent conference where distributors from Europe, Russia, USA and Scandinavia converged in a beautiful farmhouse just outside Barcelona to share ideas and experiences. We were entertained and excited by the growth of pHformula and the new product launches. The educator’s conference was an enjoyable 2-day event held in Room Mate Carla Hotel in the heart of Barcelona, a short walk from the famous Sargada Familia. Both days were packed with excellent presentations on skin ageing and in depth management of skin disorders using pHformula. Various educators shared their experiences and shared their combination therapies integrated into their markets. One fantastic tip I do need to share with you all is the use of CR on acute Post inflammatory Pigmentation. The rationale is if you reduce inflammation at the melanocytes it reduces the production of melanin. It for me was a “light bulb” moment and makes perfect sense. Follow the usual steps, apply CR and leave for 15 minutes then follow with the MELA powerclay. The educators are reporting excellent results in reducing PIH. The Spanish educator Susanna Porrass provided a very entertaining presentation and detailed explanation of the retail products as well as sharing key education guides, which I will be circulating to you all as soon as they have arrived from the printers. The fantastic guide compares the brand and its management of skin to be a motorised vehicle and how the products and treatments all work synergistically to get the skin to run and function as smoothly as a car. Absolutely fantastic and will help in the education of your customers in the appropriate skin care and treatments for their skin. We were also introduced to the forthcoming developments and product launches and a couple I will share with you, as they are too exciting to keep you waiting. I am delighted to hear they are formulating a skincare range specifically targeting the young acne prone skin. This will include the AC Spot on which they have repackaged and increased from 10ml to 20mls. There will be the addition of a cleanser and moisturiser in larger volumes. The retail pricing will make this an affordable range for the young cash poor customer. The expected launch is early 2018 but I will keep you all informed nearer the time. As an educator, I was over the moon to hear the Skin Specialist workbook will soon be available as an app. This app will be for i-pad/i-phone users and will have not only the workbook but also guidance on pHformula and its use with medical devices as well as combination therapies. This for me is a fantastic development. This means any new technical information on products or new treatments can be easily updated into the app. With technology being such an integral part of our lives, having easy access to protocols, product information and ingredients I am sure this app will be a huge bonus supporting your day-to-day work. I will keep you all informed but in the meantime, if any of you would be interested in this app please do let me know. Don’t forget about the offers we have on at the moment. Information has been sent out to email so if you haven’t received the emails then please let me know.